"This Cucumber Salad is made with onions and creamy salad dressing. Very easy!" In a large bowl, combine the cucumbers, onion, salad dressing and salt and pepper. Mix together and serve. this recipe was easy, but it tasted too bland. I had to doctor it up a bit just to make it a lil more tangy. Dill weed and a bit of vinegar helped lots. This is delicious and so simple. 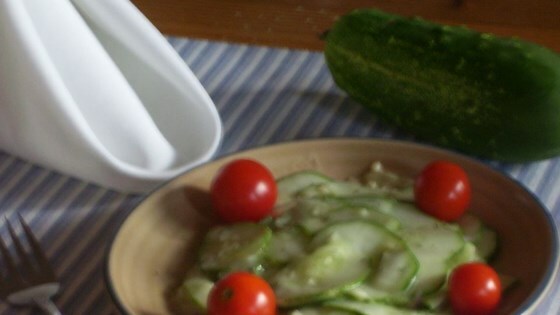 Use a mandoline to slice the cucumbers - fast and easy! You could slice the cuke a little thicker, and put the slices in sour cream french onion dip, or add extra onion and put it all in just sour cream. Quick, easy side salad.